Professor Nathan Alexander taught for 50 minutes while taking care of the child - and even took questions after class while keeping the little one close. 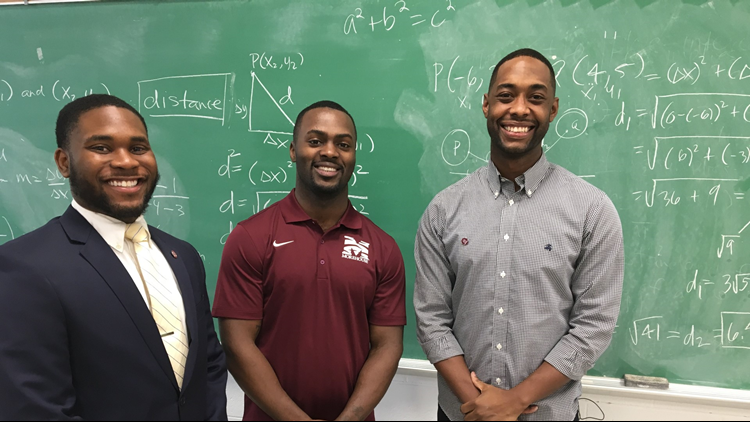 A Morehouse professor has gone viral for an act of kindness for a young father in his classroom. In a photo that has since gone worldwide, Professor Nathan Alexander is seen teaching in class - likely like he would any other day. There's only one thing that's different. He's seen wearing a baby holster with a baby in it. Morehouse Senior Wayne Hayer Jr. is a kinesiology major, VP of the history club, and holds two jobs, on top of being a dad to 5-month old Assata. After catching Hayer texting in class checking on his wife and daughter, Professor Alexander told him that if he ever needed to, he could bring little Assata to class. Two weeks later, the 26-year-old dad found himself needing to do just that. "I was like, you have every reason to stay home. You have every reason to not come to class today," Hayer remembers telling himself, before taking the leap and walking into the class of 34 males, with his infant in toe. Professor Alexander welcomed him into the class and even took little Assata so that Hayer could take notes during the lecture. Nicholas Vaughn, a fellow student took the picture that went viral over the weekend. "Student came to class today with his child due to no babysitter or anybody to watch her while he was in class. My professor NATHAN ALEXANDER said “I’ll hold her so you can take good notes!” #HBCU #morehouse #Respect"
That post has since exploded and gotten the attention of many across the U.S. and beyond with over 76,000 retweets and more than 300,000 likes since it first appeared on March 1. 11Alive Digital Producer Lindsey Basye sat down with Professor Alexander, Wayne Hayer, and Nicholas Vaughn to find out how the national recognition of this small act of kindness has affected their lives. "Dr. Alexander taught and held the baby for 50 minutes and then again later during his office hours when student needs extra help," Morehouse College spokesperson Aileen Dodd said. In addition to catching the attention of so many across the internet, the moment has also brought praise from the President of Morehouse. "This is about #love and #commitment. Loving our students and being committed to removing any barrier to their pursuit of excellence," President David Thomas tweeted. So who is this professor who has helped restore the internet's faith in humanity? On his own website, Professor Alexander describes himself as the James King Jr. Institute Visiting Professor and Associate Director of Communicating TEAMS at Morehouse College. He is also a state director of a STEM teaching fellowship in Georgia as well as a founding partner of Alexander, Kaufman & Associates. "I had no idea how big this would get," says Professor Alexander. That day, his goal was to make sure his student could take good notes. But it looks like the internet ended up taking note as well.